The fastest and least expensive way to bring new life to any space is to add a fresh coat of paint. If you are looking to give your home a makeover, begin by changing the ambiance of each room with a brand new color palette. By following this step-by-step guide, you’ll use expert tips and techniques for a beautiful DIY paint job. First, clear out all the furniture in the room — or at the very least, move it to the center of the room and cover it with a tarp. Carefully cover your floor with a large dropcloth in case of paint spills. Remove all your hardware and electrical outlet covers and put them in a safe location. 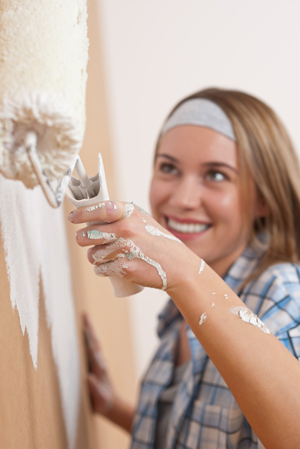 Repair any holes or imperfections in your walls with putty, caulk or spackle. Allow the spackle from your repairs to dry overnight. Wash your walls with a little bit of dish soap mixed with water on a cellulose sponge to remove any leftover dust or dirt. After the walls have dried, mask all your trim with blue painter’s tape. Priming the walls gives the topcoat something to grip. If your paint is a dark color, ask to have your primer tinted a similar color to reduce the number of coats of paint needed. Prime the ceiling first, then the walls. Wait for the primer to dry before applying your paint. Step 3: Paint the walls. Once your primer is finished drying, use an angled brush to cut in the edges where you’ve taped. Take care not to use too much paint on the brush at one time; the taped edges can leak, and the paint can look bumpy. Use a roller brush to paint the rest of the ceiling and walls. Roll the brush in a W shape to distribute the paint evenly. Allow the walls to dry completely before you apply a second coat of paint. Step 4: Paint the trim. Remove the painter’s tape while the walls are still wet to minimize bleeding. Pull off the tape at a 90-degree angle for the cleanest edge. Allow the walls to dry, and then paint the woodwork, windows and doors. Step 5: Make a sparkling finish. Touch up any mistakes with a small brush. Allow all the paint to dry completely before replacing your hardware and outlet covers. Remove dropcloths, put your furniture back in place, and enjoy your gorgeous new room. Don’t spend time trying to make the first coat of paint look perfect. It’s better to get clean, smooth coverage without bumps. The second coat will fill in the gaps and give you that rich finish you’re after.